Examples show how task specific electrical stimulation can improve range of motion, (ROM), decrease spasticity (as resistance to passive stretch or motion) and improve lower extremity function and posture and gait. NMES = neuromuscular electrical stimulation. TASES = task specific electrical stimulation. ES = electrical stimulation. The three photographs (below) are of a child with CP, GMFCS Level IV, at eighteen months of age. In the first photograph the therapist is trying unsuccessfully to bend his knee. He is standing at a table and trying to reach a toy. The therapist is having a difficult time as the child is strongly straightening his knee. The next two photographs show him standing easily at the table with support. He flexes the knee of the leg stimulating the gastrocnemius calf muscle. The stimulation alternates between one leg and the other so he alternates knee flexion while standing. It is surprising that the right stiffer leg flexes more than the left when ES is used. NMES can help children of all ages. This child (below) is seven months old and has severe mixed quadriplegic cerebral palsy. When he stood, his feet turn out and are severely pronated. He was scheduled for surgery to correct the foot position at 14 months of age. The physician had not seen him for three months. So a few days before the surgery he was seen. 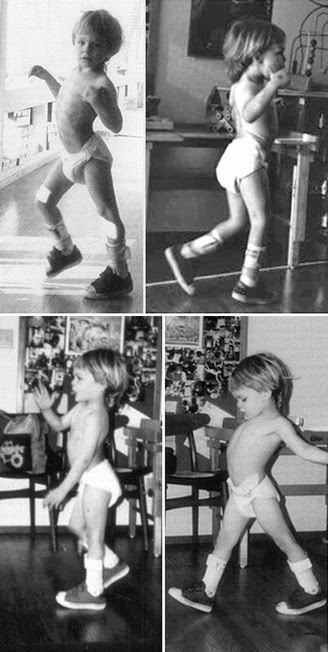 The second photo was taken seven months later when he was 14 months of age after NMES had been used for seven months to various muscles. The surgery was canceled and never done. This child (below) has spastic diplegia and walked with support, (GMFCS level III). At age 6 he received new hinged AFO which were blocked and did not act like hinged AFOs. Since he was not able to bend the ankles and more his body over the stance leg, he compensated for the loss of mobility by rotating his legs inward. Then he was able to move the body over the shorter foot lever. In the photograph taken from the published article, he is case 3. He is walking with support in this and the next photograph. Carmick J Pediatr Phys Ther. 2013 Fall;25(3):331-7. (A) The child described in case 3 walks in HAFOs with blocked toe extension and is given slight trunk assistance for balance. The areas of the brace that were blocked were removed and he was immediately able to walk with support without internally rotating his legs. (B) He walks in HAFOs and shoes after the toe extension block is removed. His hips are no longer internally rotating. Of course AFOs are not the only reason that a child adducts or internally rotates the hips or legs. The muscles may be tight and not growing or developing as the bone length grows. Thus the muscles may become more spastic, however, with muscle function and use spasticity decreases. The natural history of spasticity shows that spasticity begins to decrease at about age 4 until age 12. It may be that during those years the child is learning to use the muscle and muscle use may be what is decreasing the spasticity. As the electrical stimulation or voluntary muscle contraction stimulates the muscle, the nerves send sensory awareness to the brain and the brain may use this information to better control muscle function. At age 6, (below) when the hip adductor muscles were stimulated for the first time, he spontaneously abducted the leg and remained in that posture as he played at a table. This change in hip abduction carried though in gait as the remote switch facilitated the muscle at the needed time. Electrical stimulation was given task specifically in once weekly PT sessions and he continued to progress instead of the expected regression after the age of 7. He progressed and no longer needed HAFOs or supramalleolar orthoses, but he just used foot orthoses in his shoe. In the photo below (A,B) he is walking a few feet before he falls or is able to touch furniture. He is still a bit on the toes with internal leg rotation. In figure C & D he is age 8 years 9 months and is walking independently indoors and out. He arms have lowered and the legs are straight, not internally rotated. He has progressed clinically significantly as he changed from GMFCS leveI III to level II as is shown in the chart seen in the introduction page. Children are expected to follow their level. He did initially but as his muscle strengthened and motor control improved he made significant improvement until he reached level II when was able to walk independently. 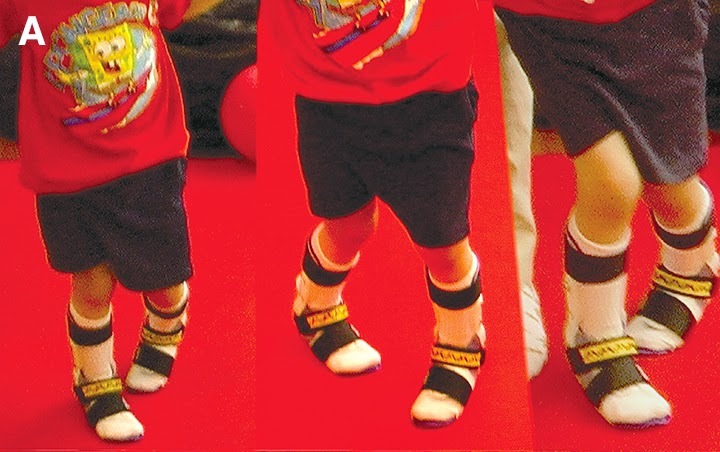 Video evidence of using TASES to assist gait can be seen in this publication: (link) Importance of orthotic subtalar alignment for development and gait of children with cerebral palsy. It is important to evaluate the orthoses that a child uses because blocking any joint will require the child to compensate for the loss of movement. The next illustrations explain and show the compensations. (Below) Standing: The top row is with solid ankle AFOs and the bottom row is with hinged AFOs. (Below) Walking: The top row is with solid ankle AFOs and the bottom row is with hinged AFOs. Carmick J. Managing equinus in a child with cerebral palsy: merits of hinged ankle-foot orthoses. Dev Med Child Neurol. 1995;37:965-975. In the top row the child walks with solid ankle foot orthoses (SAFOs) after 2 years of their use. The orthoses did not prevent regression so four surgeries were recommended. In the second row the improved alignment and gait is seen after the orthoses were changed to allow dorsiflexion and digit extension his gait changed immediately. No surgery was given. The lower pictures show the first time the new orthoses were used. Here he has heel strike on either leg, decreases hip adduction, no longer internally rotates the legs, or walks in high guard. It appears that denotational osteotomies, heel cord or hamstring lengthening are not needed. Evaluation of orthoses is needed before using electrical stimulation. Orthoses which block movement or hold the foot in poor alignment cannot be corrected with ES. 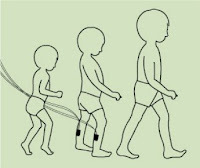 Once the orthoses are operating as desired without unnecessary compensations, electrical stimulation can be used task specifically during gait to improve muscle function as the child grows so that walking flat footed or with heel strike and without compensations can be achieved. His case is presented in this article: Carmick J. Managing equinus in children with cerebral palsy: electrical stimulation to strengthen the triceps surae muscle. Dev Med Child Neurol. 1995;37:965-975. Because the children are awake and aware of the stimulation, actively participating in a task and not asleep or lying down, carry over can and did occur. Movement science has shown that for there to be carryover from exercise or practice of an activity it needs to have be task-specific. 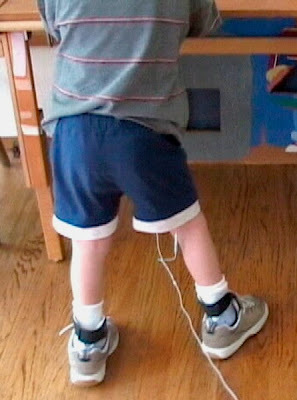 Task specific electrical stimulation (TASES) is able to help the child continue to develop over time if the needed muscles are stimulated and the needed joints are allow to function. Once the orthoses fit well and provide needed support without unnecessary compensations, electrical stimulation can be used to improve sensation and muscle function. Many people are afraid to activate the calf muscles for fear that the child will walk even higher on the toes. If the stimulation is set for the task of typical gait, and the amplitude is not at the maximum, which may increase toe walking or running, TASES usually is helpful. When TASES was first used to the medial gastrocnemius muscles the child immediately changed from high toe walking to a flt footed gait. It was well tolerated probably because he felt better with improved balance and motor control. The fact that the arms were lowered and no longer in high guard is an indication that his balance was more stable.